Apartment living is becoming increasingly popular, and not just among the younger generation; even baby boomers are foregoing their sprawling mansions and adopting luxury apartment living lifestyles. And why wouldn’t they? Today high-end rentals include not only luxurious and spacious accommodation, but also a wealth of extra amenities such as large communal areas, green spaces, restaurants, concierge services, and even movie theatres. Here we will take a look at some recent luxury apartment developments and why they are often the ideal housing choice for millennials through to baby boomers, but our main focus will be on why so many developers of these superbly designed spaces choose to furnish them with bamboo floors. Let’s start with an example. The above photo was shared with us by the Managing Partner of Paragon, a property managing company based in Boston. 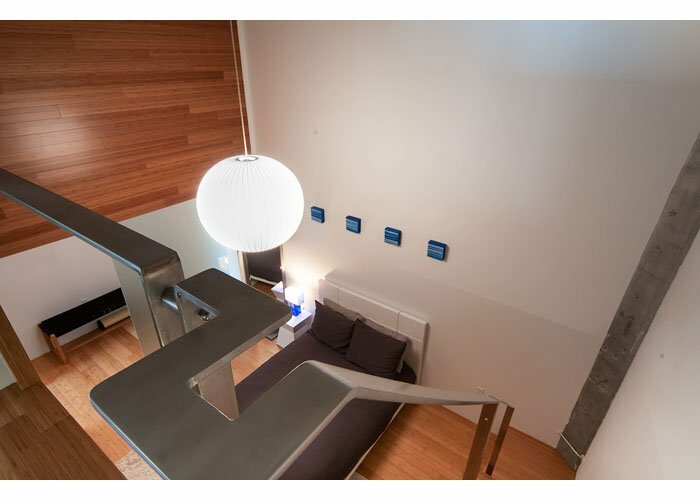 This is part of a luxury loft conversion where every room is furnished with high end bamboo flooring. In fact, as an extra touch, even the wall panels are made from bamboo. Durability is of utmost important in rental properties, as they face considerable wear and tear and oftentimes high turnover. Bamboo flooring is available in today’s market, and is well suited for high traffic. 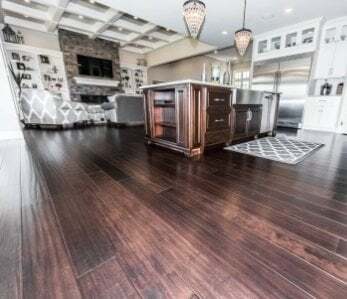 The upkeep costs of a traditional hardwood floor such as oak are considerably higher, as each new tenant expects their new apartment to look pristine when they move in. To maintain it’s stylish appearance through multiple tenancies, frequent refinishing of conventional hardwood flooring is required. This is not the case with bamboo flooring, which hardly (if ever) needs refinishing in a residential setting. is three times harder than oak, so is far less susceptible to wear and dents caused by heavy furniture, children and pets. A strand woven bamboo floor will keep its good looks throughout the tenancy and will require virtually no maintenance apart from routine cleaning when new tenants move in. Here is another picture from Paragon; another loft with a beautiful bamboo floor. The use of bamboo in high rise developments isn’t new. 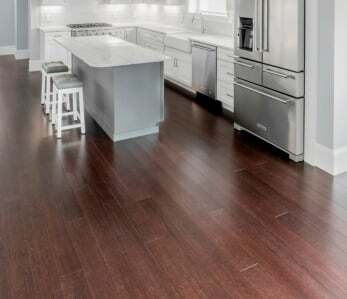 Bamboo first became popular with high-end builders some years ago, but it also attracted some criticism as those early bamboo floors were prone to shrinkage. However, now that much-improved bamboo flooring made from strand woven bamboo is available, shrinkage is no longer an issue. Strand woven bamboo flooring is highly stable as well as offering superior performance and resilience. 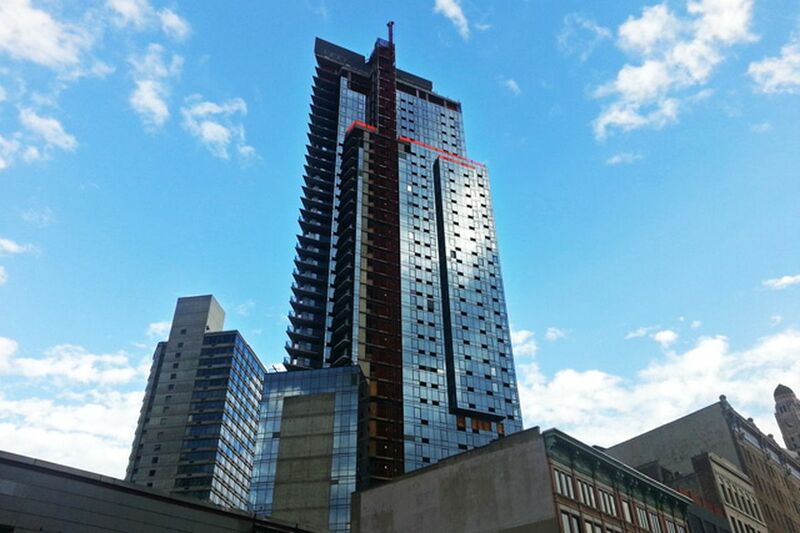 Here is a development in Downtown Brooklyn known as 66 Rockwell. The 42 story development includes one and two bedroom apartments and tenants have access to some 10,000 square feet of shared amenity space including a rooftop sundeck, a Zen garden, a library, a health club, and even a poker room. Every room in this luxury development boasts a beautiful bamboo floor. Of course, the design world is a keen follower of fashion, and bamboo flooring is undoubtedly fashionable, which is one of the reasons the architects selected it. But bamboo floors are far more than a fashion statement that will soon be replaced by another latest trend. 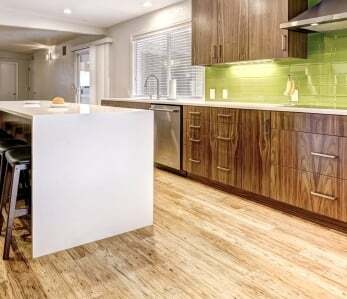 Unlike other trends, bamboo flooring is here to stay due to it’s toughness and because it is . 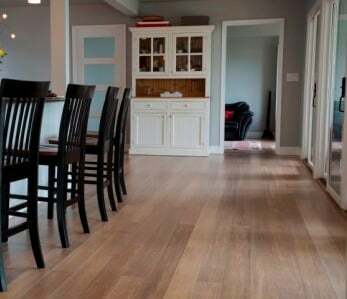 Bamboo flooring is built to last. Given normal maintenance, the hard wearing strand woven bamboo flooring in each of the apartments in the 42 story 66 Rockwell development will retain its good looks and will continue to stand up to the heavy foot traffic and possible neglect from the very many tenants who will walk and live on it. It will continue to look great through the tenancy and between tenancies. Without a doubt, it is the ideal choice for property investors. In the introduction, we mention the increased popularity of apartment living across the generations. Let’s look at this demographic in more detail. Baby boomers bought when a property was an affordable investment and in plentiful supply. Today many of these with empty nests are selling their large mansions to live in luxurious rental properties will all the amenities in areas close to eating, shopping and recreation facilities. Generation X is less likely to buy a property than you might think. In a recent survey, over a third of respondents stated a preference to rent. Millennials move into home ownership much later than either of the other two generations. Nearly a half prefer to spend their money on travel and other lifestyle enhancements than on buying a home, For them, renting is the preferred option offering greater flexibility and choice. One result of this is a booming investment property market. According to Forbes, many metropolitan areas in North America are experiencing unprecedented levels of investment property sales. Here is a small sample of them. West Loop Luxury Apartments is a new development in Chicago’s West Loop. Once an industrial manufacturing area, West Loop is now a trendy part of Chicago. The development includes five luxury rental apartments and includes bamboo floors throughout. The Palisades of Towson offers an “ultra-luxurious lifestyle” and includes a range of studio, one and two bedroom apartments for rent. Each apartment is luxuriously equipped and includes strand-woven bamboo flooring. Instrata Brooklyn Heights in Clinton Street, Brooklyn is a refurbishment project based on the historic 75 Clinton Street built originally in 1910. With some of the highest quality New York rentals, the apartments include bamboo flooring throughout. 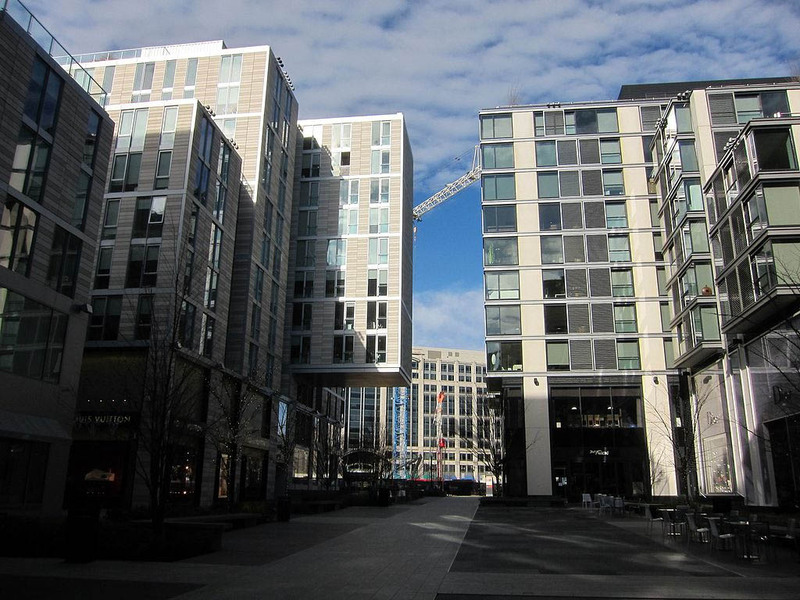 The Apartments at CityCenter in Washington DC include 57 bespoke apartments ranging from studios to penthouses. Every apartment provides bamboo flooring throughout. 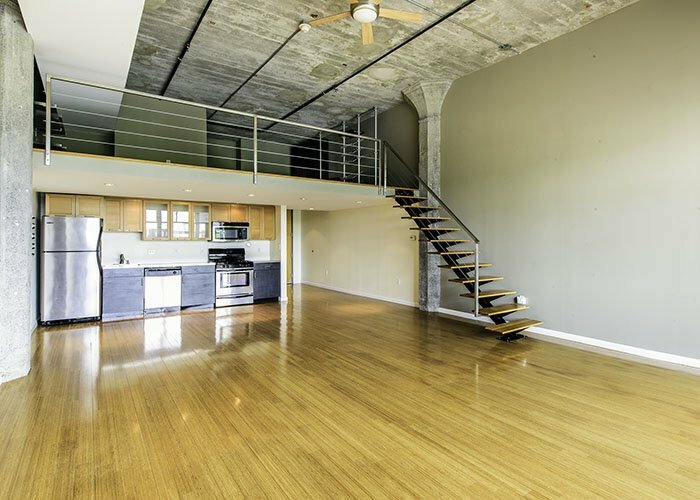 Porterlofts 156 offers a wide variety of loft spaces with a range of styles marketed as investment properties. The building is a converted warehouse with many preserved features along with new constructions. A significant feature of these conversions is their bamboo floors. NoMad High Rise in New York offers 800 luxury apartments over 36 floors all of which include quality bamboo floors. The rental is pet-friendly, which, of course, is yet another advantage of bamboo floors; they are resistant to pet stains. It’s the same story all over the world; From New York to Sydney to Singapore, top-end property developers love bamboo flooring. Another important consequence of the changing housing demographic is the rising popularity of co-living, which is further fuelling the boom in luxury apartment construction. As we have said, one generation that is finding apartment living their preferred lifestyle choice is the millennials. If you are a Millennial yourself, you will probably know already what we are about to say, but if you are a Baby Boomer of a member of Generation X, then you might wonder what is so different about the generation that was born between 1981 and 1966. They are far less likely to own their own home. While part of the reason for reduced home ownership is financial, the other part is their personal choice. Today many millennials choose not to purchase a home, even if they can afford to do so. Millennial renters have a different view on their home than previous generations. As long as amenities are close at hand, they are happy to sacrifice space in their personal unit opting for apartment buildings that provide co-living and co-working spaces where they can socialize. As a result, many modern luxury apartment building developments emphasize healthy sustainable living, wellness, and community. This video explains a little more about the generation and why they are so different from previous ones. While co-living may not be the choice of other generations with the possible exception of the elderly, many millennials embrace this alternative lifestyle. For them, co-living is the new way to live, work and have fun, particularly in cities. Co-living is a worldwide phenomenon and provides young people with a shared sustainable living space where the community is a major focus. It is also affordable. For each individual, co-living means being part of a community sharing spaces and events while having your own private apartment in which to end the day. Across the world, developers are creating purpose-built luxury co-living developments. 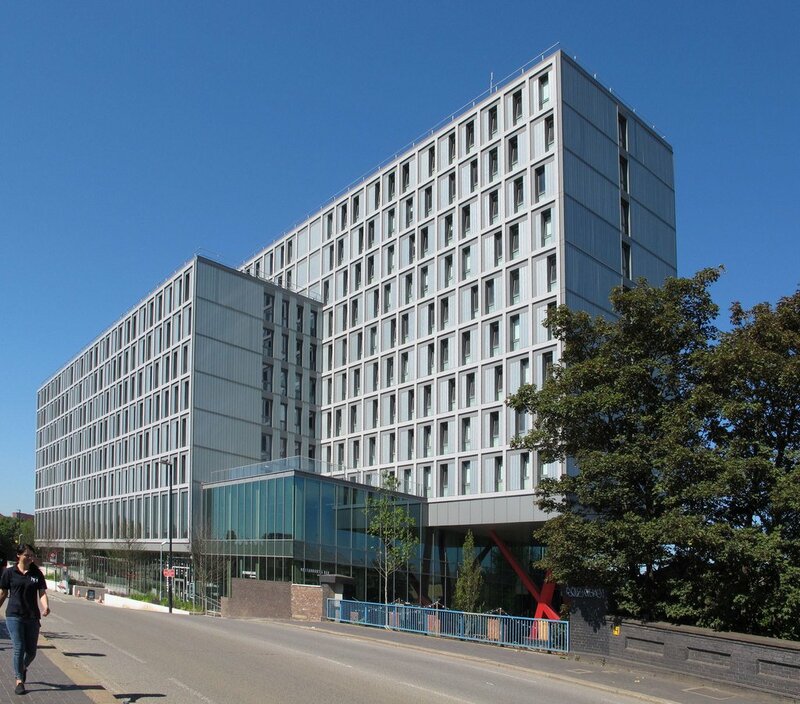 A typical example is the 500 apartment Old Oak development in London pictured below. Each member of the Old Oak community rents a private studio apartment, has access to many shared spaces, has all the necessary amenities at hand, and can enjoy frequent community events. And, you no doubt guessed it, bamboo floors feature throughout. An added benefit is that the millennial generation as a whole is very concerned about the environment. For them, bamboo flooring is the perfect choice because of its sustainability. in the world. 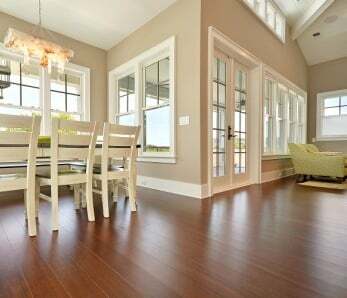 Bamboo flooring is stronger than conventional hardwood floors, being three times harder than oak. Bamboo flooring is favored by designers because of its stylish and versatile looks. Have you come across new luxury apartments featuring bamboo floors? Do let us know, and why not send us some photos of them?